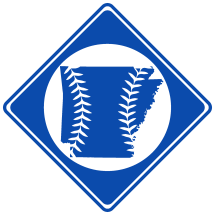 Rooster Field was a baseball park in Hot Springs, AR and was used by the Rogers Hornsby Baseball School and perhaps the Chicago White Sox’s minor league teams, who trained in Hot Springs from 1948-1951. The ballpark was built for the city’s Army-Navy baseball team, who needed a place to play. Rooster Field was located in a city park known as Jaycee Park, named after the Hot Springs Junior Chamber of Commerce. When the members of the chamber reached the age of 41, they became known as ‘Exhausted Roosters’, and Rooster Field was named likewise. Rooster Field never featured much more than a playing field and a backstop, and the field itself was not very ideal. Nevertheless, the ballpark had a nice infield, and was occasionally used in the late 1940s by the Rogers Hornsby Baseball School. In 1947, another field was built at Jaycee Park, and it became home to the Hot Springs Bathers, a class C minor league team. The team may have used Rooster Field for practice. Between 1948-1951, the Chicago White Sox’ minor league teams held spring training in the city and likely utilized Rooster Field.